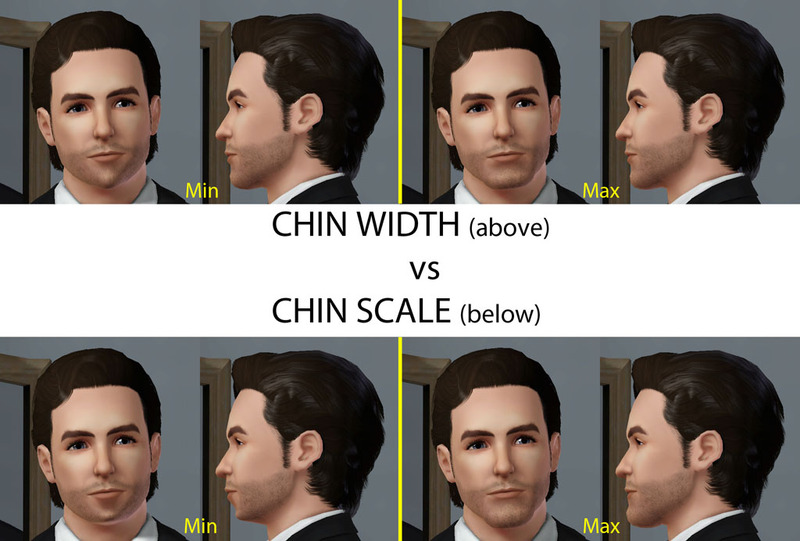 I really hated how if I wanted a sim to have a narrow chin or a wide one, I'd have to use Chin Scale which would shrink/expand the chin not just in width, but also height and depth. A narrow chin would end up this pointy weird looking thing, and a wide one ended up big fat and bloated. I've always wanted a Chin Width slider which affects only the width while leaving height and depth alone. As soon as Delphy released his tools to allow people to create their own sliders, the very first one I made was Chin Width. I guess I wasn't the only person who wanted Chin Width, because almost a year and a half later, EA put a Chin Width slider into Sims Medieval. I haven't needed to change it for years, so it should be compatible with all versions, all expansions, all stuff packs. I have recently added translations for all Sims 3 locales, many using Google Translate, so let me know if the translation for your language is incorrect. By default, this slider appears in CAS under the Chin category, between "Chin Underlip Depth" and "Chin Height". It affects toddlers thru elder. You can get the sim used as the model in the pics here. v3 - Added 10 additional translations. v2 - Added Danish and Norwegian translations.